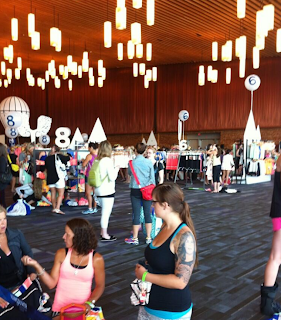 I had a really great day today hanging out with a few of my lulu friends, one of which is Lulu Addict, at the SeaWheeze Showcase store as well as lunch after and a bit of lulu shopping on Robson street. I also got to say hi to familiar faces and saw some infamous faces from some of the lulu groups and that was pretty exciting for me. I woke up really early this morning with the plans of getting to the lineup by 6:15, but unfortunately there was an accident on the highway so traffic was really bad and I didn’t get there till 6:45. There was plenty of people ahead of me in the line but I got in just before the line up exploded behind me and wrapped around the entire building. I waited about an hour in this lineup before getting into the building where the runners and shoppers got split up into different lineups and the shopper lineup got held back for about an hour and then we were let in 10 at a time every 10 minutes. I thought that was pretty fair and short of banning none runners altogether I think lulu did their due diligence in ensuring runners got a head start ahead of shoppers and volunteers. There was also a lot more product this year than last, and also a lot more people. I didn’t think items would sell out all that fast but when I came back through the building to get to my car this afternoon at about 1pm, all of the Cool Racerbacks where gone and the duffel bag had plenty left over and was marked down to $108 (from $148 I believe). Lots of swiftlys left over, some crops, some shorts but not a big selection. Because they were holding people back from going in all at once, the store inside was much less chaotic than last year, the lineup to pay was much more bearable. One pretty major thing lululemon dropped the ball on and I hope they fix for next year is they really should have porta potties around the lineup. There was a washroom just inside the building we were lining up outside of but we were not allowed to use that washroom and where told we had to find one down the street at an accommodating starbucks or other building. Fine if you are lined up with friends who will hold your place in line as long as it takes you to find a washroom, but if you are traveling on your own like I was at first, you had to wait. Then, the next option for a washroom was in the second lineup inside the building (again, if someone was willing to hold your place in line), and if you didn’t go there before making it into the ballroom you were stuck holding your bladder while shopping and lining up again at the till. 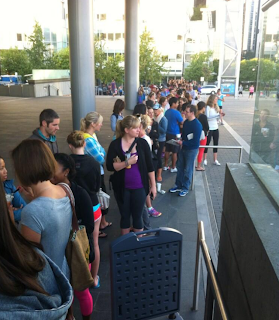 If you are like me you need a venti coffee to lineup for anything at 6:45 am, and so my bladder was really super full. I got to use the washroom just in the nick of time before getting into the ballroom but that was thanks to a generous Volunteer who assured me she’d keep my place in line. There was a 15 item per person limit but that was only enforced at the till. 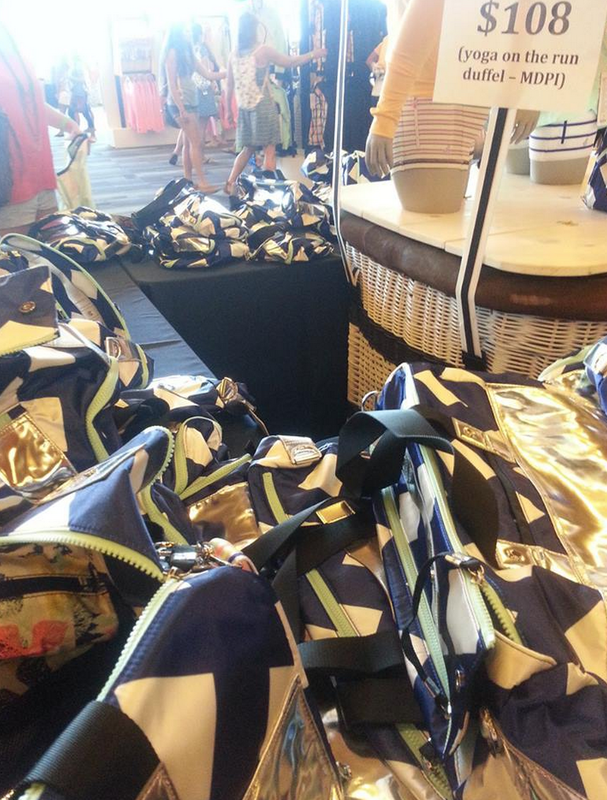 People could lineup again with more items after discretely stashing their shopping bags with friends. Thats if they didn’t mind waiting in a big lineup again. This year, runners did not get a discount at all. These were my purchases. 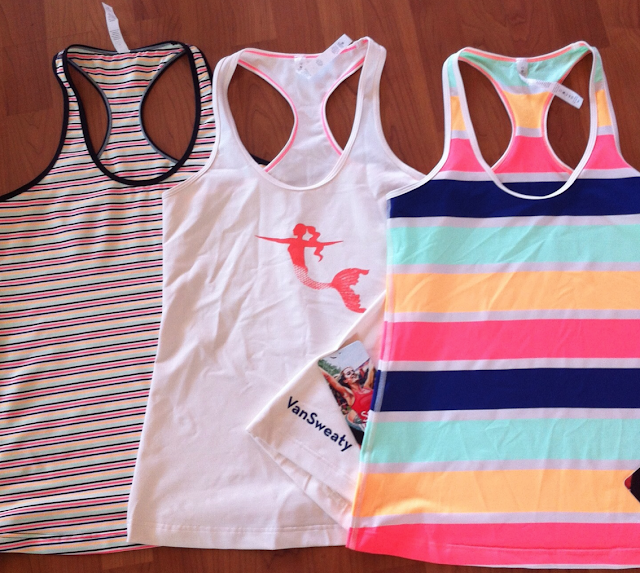 They are all luxtreme Cool Racerbacks but they are softer and silkier than last years and much stretchier. I also got them in my upper size since last years was so tight and huggy and these ones drape much nicer. They are also designed in Vancouver and made in Canada which I love. I initially thought I was only going to get myself Track Attack Shorts but I really didn’t love any of them. 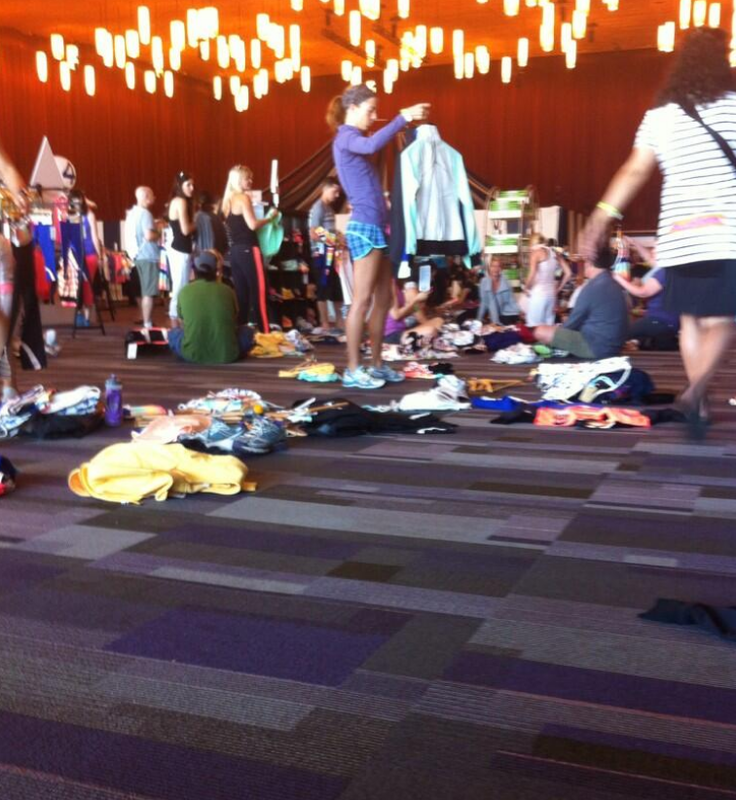 I hoped there would be a plaid version of the Track Attacks but the only item in the SeaWheeze 2013 plaid was the Track Attack Jacket. After the Seawheeze store I went to lunch with Lulu Addict and a few other gals, then we hit up the Lululemon store on Robson where I got a Midnight Iris Cool Racerback (high polyester but it feels a lot silkier than any other poly CRB, it’s not see through at all, print doesn’t distort when stretched or go white, and it’s made in Canada) and I got the very last Tuck And Flow Long Sleeve in Plum that was left in store (my store never got Plum). This was a surprise love since on upload Monday it was off my radar, but it’s super cozy and soft and I’ve loved every picture of it I’ve seen on facebook. I’ll put up another post shortly of all the items I saw at the Seawheeze Showcase store. I’d say all in all the shopping experience was good, a bit better organized than last year. 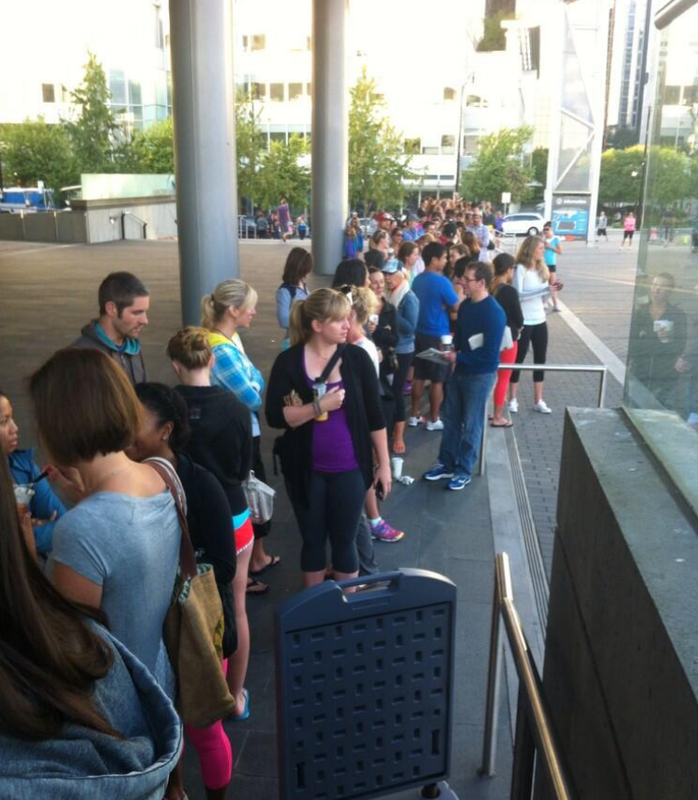 More attention was made to ensuring runners that made the effort to get there for opening got first shot at product. Yoga On The Run Duffel repriced to $108 by afternoon, from $148, since they were not selling well.